Home > Preview > We go hands on with the Nintendo Switch; is it the console of your dreams? We go hands on with the Nintendo Switch; is it the console of your dreams? 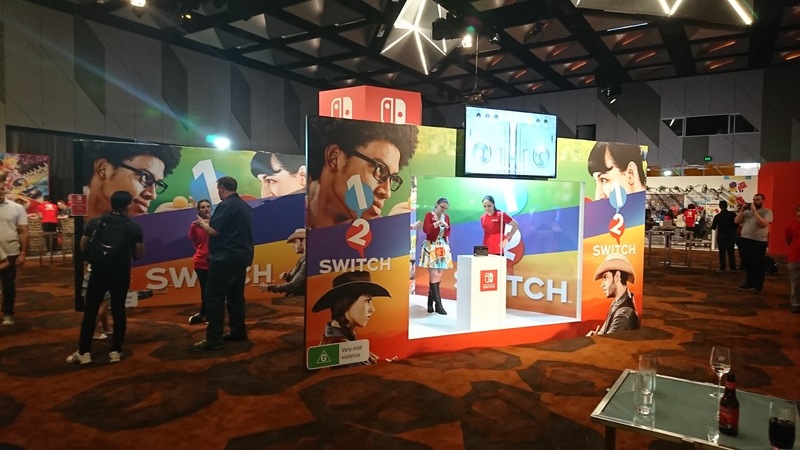 With the recent Nintendo Switch presentation, Nintendo of Australia kindly allowed us some hands-on time with the device to follow up on what was overall a mixed presentation. 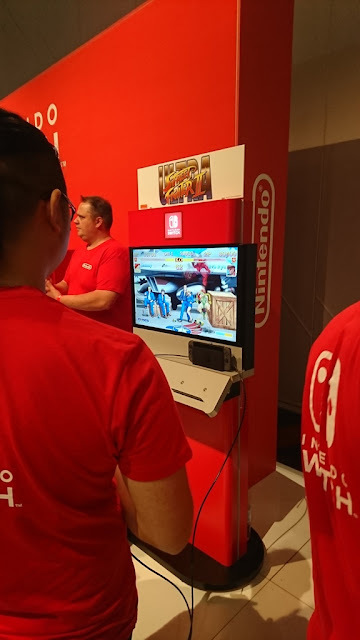 We were able to put the hardware through its paces, and had the opportunity to play the Switch in just about every control style. We will post up some game previews throughout the week, but first, given that the Switch is a pretty unique product, we will be focusing on the hardware first. The Nintendo Switch in terms of diameter is slightly larger than a closed New 3DS XL. The screen also takes up almost the entire tablet itself, making the screen size comparable to a mid-range phablet. It’s big enough to show detail in games like Breath of the Wild and Mario Kart 8 with no issues, but playing multiplayer games in tabletop mode requires that the players to be pretty close together to see the screen when playing. The max resolution able to be displayed on the screen is 720p, so the visuals aren’t on par with the latest mobile phones or tablets, but is crisper than the PlayStation Vita. Being a console/handheld hybrid, the Nintendo Switch is going to need to be sturdy for playing games on the go. Aside from the 2DS, this is the first time since the Gameboy Micro that Nintendo have opted against having a protective clamshell design for a portable system. My initial prediction is that this will leave the system open to accumulating surface scratches on the screen, which could prove problematic. I personally have quite a few on my PlayStation Vita. There are protective cases being made for the system, and I would recommend picking one up to avoid scratches on the screen. No doubt there will be clear screen covers too; grab one of those. The rest of the console feels nice in the hands, it’s actually surprisingly thin, while feeling like an expensive piece of tech. The weight of the console is hard to gauge though, as they were all tethered to a desk or the dock to prevent theft. The Joy-Con controllers feel nearly weightless when removed from the system. Using them in games like ARMS felt much nicer than using the heavier Wii Remote and Nunchuk combination in Wii Boxing. The Joy-Cons are not huge, and were only marginally taller than my closed New 3DS XL when I sat them side by side. I was initially worried that using the Joy-Cons like a classical controller would be difficult due to having large hands, but found it to be surprisingly natural in my hands. Swapping between the left and the right Joy-Con took a little bit of getting used to due to the control stick and buttons being in slightly different positions. Playing Mario Kart 8 was a breeze, even though I was used to the gigantic Wii U GamePad. The control sticks click in as well, though the shoulder buttons did not seem to be analogue, making the constant rumours of a Gamecube Virtual Console on the Switch a tad harder to believe at this point (the Gamecube's shoulder buttons were analogue in design, so in some games you could apply different amounts of pressure to the buttons to create different impacts in-game). The force feedback in the Joy-Cons was very weird at first. I’ll get into more detail when I preview 1-2 Switch, but needless to say, what the “HD Rumble” achieved was pretty remarkable. I was able to guess how many virtual items were rolling around inside the controller, which was pretty neat. I also had some time to put the Pro Controller through its paces on Breath of the Wild. Sitting back in a chair with the Pro Controller in my hands is definitely the way to play those longer adventure games such as Breath of the Wild and Skyrim. The controller is much like the Pro Controller on the Wii U, next to no weight to it and it fit snugly in the palms of my hands. It also has an internal gyroscope this time, so it can be used with games like Splatoon 2, which requires the gyroscope to aim. Testing the gyroscope proved to be very responsive and accurate, without the need to wave the controller around looking like a fool in the process. Lastly, docking and undocking the Switch. Just how streamlined is it? The only chance I really had to test it out was with the Breath of the Wild demo. Battling against my instincts, which wanted to continue to enjoy the game in action on the TV, I pulled the Switch out of the dock in the middle of my time with Breath of the Wild, the TV went blank and the control went immediately from the Pro Controller to the Switch/Joy-Con controls automatically. The game paused on its own and asked me to confirm that I wanted to play on the go by pressing L+R+A simultaneously. After mucking around in this mode I put the console back in the dock. It took a few seconds for it to register, but it was set to go before I was back in the couch, asking me to confirm again with the Pro Controller. The Nintendo rep standing behind me said that if I took the Joy-Cons out (they were blocked so I couldn’t test this out) and pressed L+R+A on that, it would go to those controls instead of the Pro Controller. Overall, this seems to be a much better system than having to go to a menu to sync the controller you want to use like on the Wii U. While it’s still early days, my first impressions of the Nintendo Switch hardware was positive. Nintendo seems to be quite genuine in its attempt to take the good from previous hardware generations and combine them into the one unit with the Switch. The overall look and feel of the Nintendo Switch seems more in line with other premium devices on the market such as Apple and Samsung’s high-end options. No more clunky plastic seen in 3DS and Wii iterations! 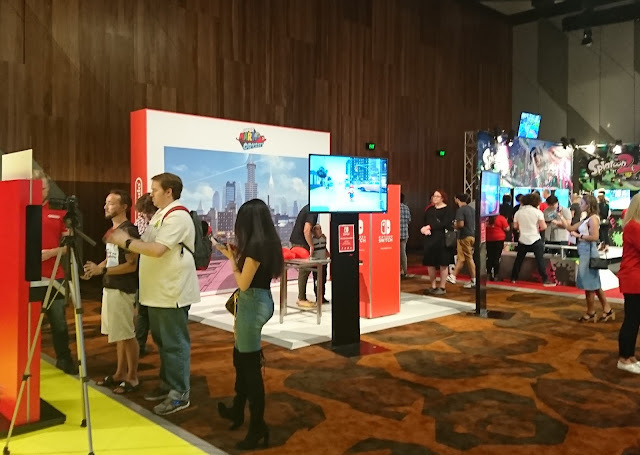 And ss much as I have enjoyed every bit of hardware that Nintendo has produced, it finally seems as though the company is finally going for that more mature market, and letting some of the software speak to families and children instead. There is definitely nothing quite like this on the market, and I look forward to spending some more time with it upon launch.